Handbag designer Ariane Gold of goldno.8 carrying the Trapezoid Clutch. Ariane Gold with her two boys Robbie and Noah. Napa Valley (www.napavalley.com). The Le Pouf drawstring nylon bag. NYC’s Upper West Side (www.domain-properties.com). The Bag in Bag by goldno.8. It’s nice to come across a handbag designer that has your best interest in mind. Who wants another clunky handbag that’s uncomfortable to hold and feels like you’re carrying a ton of bricks? Not me. Apparently, I’m not alone. 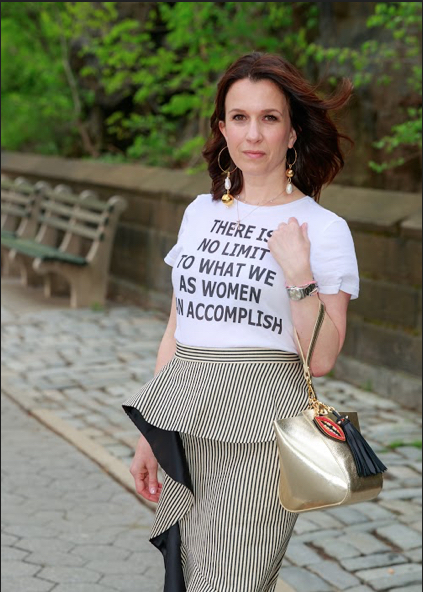 When Ariane Gold launched her handbag collection goldno.8, in early 2017, she wanted to create a handbag line that was versatile and lightweight—something that suited her busy NYC lifestyle. 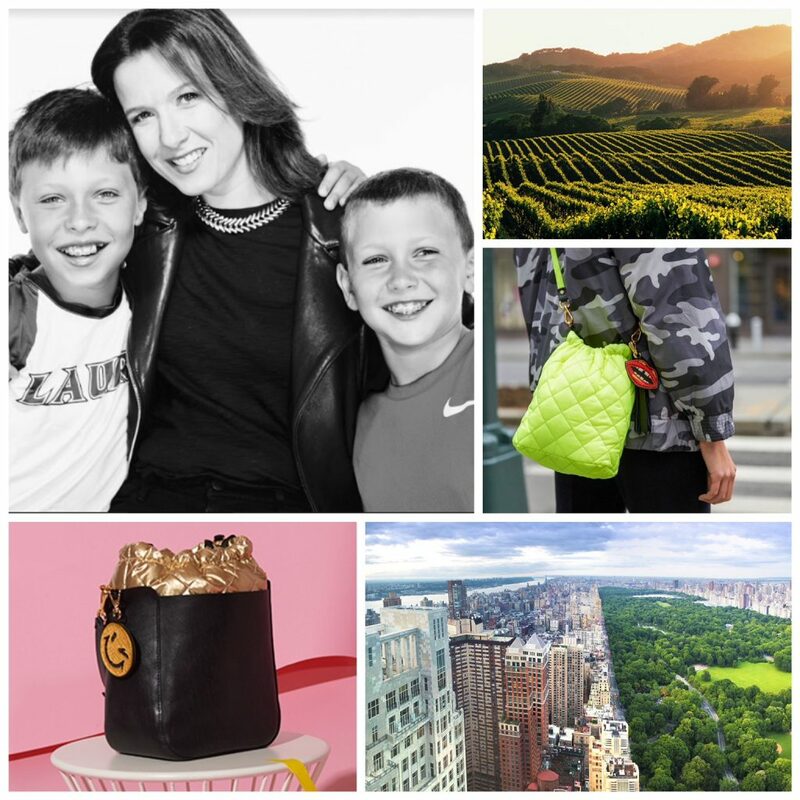 A veteran of the fashion industry (she was a senior designer at Ralph Lauren for 15 years) as well as a mom, she knew what she wanted in a handbag—and she set out to create it. I recently got to chat with Ariane about her background, the inspiration for her business and her unique collection of handbags that allows the customer to get involved. Tell me about yourself and your background: I’ve been living in NYC for 23 years now, but I’m from Toronto, Canada. I’m 45. My forties have been my favorite decade so far and I say that with pride. I live in the Upper West Side with my two boys and my dog Buddy. I’m currently engaged. Congratulations! I hear NYC is a tough place to find love: I’ve had to kiss a few frogs but, yes. I can’t believe he exists. Gold is your last name, but where does the number 8 come from? It’s is my favorite number. It’s symmetrical anyway you turn it. And this is probably the 8th business that I’ve started. Where did the inspiration for the collection come from? The inspiration for the entire collection is that I want the bag to really work for you. And I don’t want you to have one bag that you wear just one way. I want one bag that’s going to transform as you go through your day. And I want my customer to have the ability and power to create her own bag. Apart from being direct to consumer through your easy to use website, what is unique to your brand? Well, thank you. Coming up with a website design that was easy to use, wasn’t that easy. We wanted you to be able to easily customize your bag and have the ability to build the bag the way you want it. Some of our bags are reversible so they’re meant to be carried in multiple ways. How do you get your bags to be so lightweight and why don’t more handbag designers create lighter bags? A lot of handbag designers think that more is better. There’s a lot more hardware on them and part of that is that more hardware makes it look more expensive and they can charge more money. Also some of the skins they use are heavier. I prefer a more simplistic design and shape. You can be a minimalist or you can max the bags out according to your taste. The reason why they’re so light is that I start with a really light fabrication. That’s my personal aesthetic— good clean design. All our leather is Italian and we make everything in the United States. What was the motivation for your bags to be made in the United States? It would have been easy for me to make our handbags overseas, but I really believe in making my product in the United States. It was something that I really feel strongly about. I have an amazing factory that I work with, I go there often. We produce the bags in Connecticut. It’s such an important feature of our brand. I can drive out there for the day. I work with the owner and the sample makers, we build the patterns together and they’ve been incredibly supportable. And the reason why I’m able to offer the bags at an accessible price point is that it’s direct to consumer. If we had gone through third party retailers, the price would have been probably almost double what they are. I truly believe in that business model and we are able to keep the price to what it is. It’s not an inexpensive product, but it’s accessible and the quality you’re getting is really amazing. Who’s the quintessential goldno.8 customer? It’s a woman who likes style, a woman who likes function, a woman who has a voice and wants to be heard. She wants to be able to express herself and she’s a little bit of a trailblazer. She’s excited to be part of the design process. It’s a collaboration between us and our customer because she has a hand in the process. What’s next for you? We’re only available online for now but we’re looking to open our first retail store in NYC in September 2018. Right now we do a lot of pop-up events. We are going to be in the Hamptons, for several events this summer and we are always looking to do fun events. Was goldno.8 inspired by the NYC woman? They were differently inspired by my lifestyle. We walk a lot—I’m constantly juggling my work, kids and laptop. The line was inspired also by my experience in fashion. Women want to be included in the process and want to be part of the design process. Your handbags are great for travel. Where do you like to travel to (somewhere you’ve been and somewhere you’d like to go to)? I have to say my happy place is Napa Valley. Everything about it: the energy, aesthetic, architecture is just so perfect. I went to South Africa on safari years ago, and so, I’d really like to go to Tanzania and Kenya. What’s your first handbag memory? I remember when I was younger, my mom had such beautiful evening bags that I would play with. I still have them. I just love the intricately of the hardware on them. The beauty of the design and style that you couldn’t find today. I remember sneaking into her closet and now as an adult, I carry her vintage bags when I go to events. Do you have any advice for handbag designers? Yes, but this goes for anyone who wants to start a business: you have to believe in what you do 100%. There are going to be a lot of times when you question if you’ve made the right choice but you have to believe in it, don’t give up and keep going. That’s the ethos I live by and I love what I’m doing. To create your own handbag visit: goldno.8.